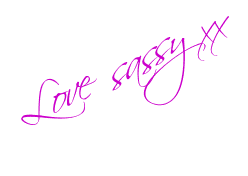 Sassys Secrets: My Little pony..
Sassy, your work is always fantastic! Guess it runs in the family. This is a really sweet card. I can't imagine my ever being as good as the two of you, but I'll continue to look. This is gorgeous sis and ever so cute, want that stamp its a tilda and I want it lol. your blog candys closed now I wnt the lot lol. 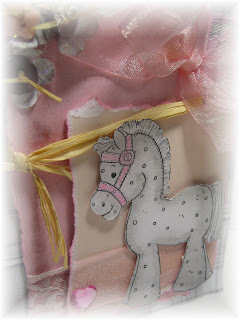 Oh Sassy yet another stunning card the colours and your layout is so beautiful and love your little pony. What a gorgeous card, I love it. The little horse is so cute, and there is nothing wrong with your colouring in. I could do with a few lessons myself !!!! This is lovely Sassy well done,(tip) I pour some Sansador into a tiny glass jar with metal lid with a small piece of sponge in it, then just dip the tip of your blending tool into it. No more spills & keeps for ages. So very precious. I just LOVE the colors. 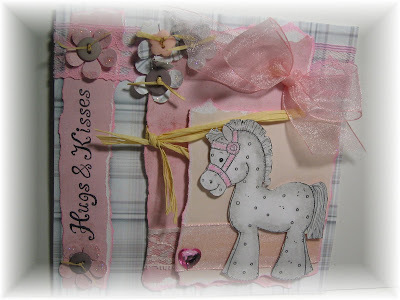 Would be a great card for a baby girl!